This follows a trial this year in the town centre and Wolstanton where the Council’s Streetscene team cleared fly tipped waste from private rear alleyways. Signs were then put up warning people that the area was being monitored and prosecution of offenders would be pursued. 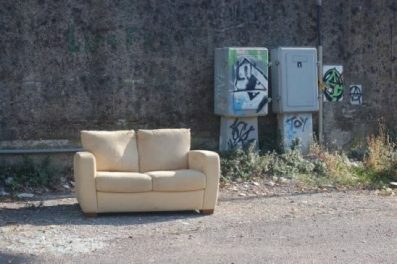 Changes were announced by the Government last year giving councils the power to issue people caught in the act of fly-tipping with fixed penalty notices of up to £400. This was to save councils time, enabling them to punish offenders on the spot without having to go through the rigmarole of the current court procedure. The Department for Environment, Food and Rural Affairs (DEFRA) have reported that there has been an overall rise in incidents of fly tipping nationally. Newcastle-under-Lyme saw the third biggest percentage increase between 2015-16 and 2016-17, with incidents rising by 225 per cent. Cllr. Trevor Johnson, Cabinet member for environment and recycling, said: “Local authorities are overwhelmed with instances of criminal fly-tipping and we needed to address this urgently. “Our policy will help to improve the cleanliness of the borough and remove grot spots which are an eyesore for both residents and visitors. “Everyone has a duty to dispose of their waste in a proper manner. Fly-tipping not only looks an eyesore, it has the potential to harm people and damage the environment – whether it happens on the streets or in rural areas. To report fly-tipping on Council land in Newcastle, visit our website www.newcastle-staffs.gov.uk/all-services/environment/fly-tipping, the government’s dedicated site www.gov.uk/report-flytipping or Crimestoppers anonymously on 0800 555 111.